We now live in a society where scientists are stating that our children (the last generation born) will be the first generation in recorded history to suffer a shorter lifespan then their parents. Did you ever in your wildest dreams imagine you would hear something like this in your lifetime? Today approximately seventy percent of our children suffer from one or more of the following, Autoimmune Dysfunction, Autism, ADHD, Food Allergies, Diabetes, Cancer, etc… This is a major catastrophe, and one our perspective governments seem to care little about. Where is the massive scientific research being funded by these entities whose job it is to protect and nourish us … the people? We can spend trillions on illegal or immoral wars … but by comparison relatively little on research into this impending catastrophe! Instead what we see is corrupt or overbearing governments who are quick to throw the blame off their actions and slam it down on unsuspecting parents via mechanisms such as SIDS (Sudden Infant Death Syndrome), SBS (Shaken Baby Syndrome) or Munchhausen Syndrome by Proxy. Whereas there may be a basis of truth in a minority of cases related to the aforementioned syndromes, more and more daily we are discovering that the causality relates back to mechanisms such as vaccines. How many loving mothers and fathers today are spending extended periods of time, up to life behind bars for accusations of severe child abuse or murder due in reality to the lethal or life threatening influence of vaccines? But the number of cases directly related to this scenario mushrooms daily! We now present to you a video of TLB Researcher and Staff Writer, Christina England. This is an individual who has lived this nightmare. This is an individual who has done the massive research to allow her to speak of this with knowledge and conviction. 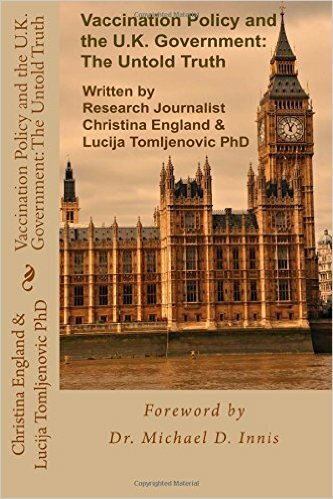 Christina has even Co-Authored a book presenting her research findings to the world titled “Vaccination Policy and the U.K. Government: The Untold Truth” (see links to book below video). If you feel this book only relates to the UK population … think again! The identical scenario is playing out in nations across this planet, with special emphasis and blatancy on the good old USA !!! I have personally done untold hours of research on the lies and misrepresentations associated with vaccines, but this work pales in comparison to the outstanding research and attention to detail afforded this subject by this books authors Christina England and Lucija Tomljenovic, PhD. Their combined efforts to shine a light of knowledge on this dark subject and carry it forth into the full and revealing light of day, is not only commendable, but extremely necessary, to facilitate the awakening of enough of the (intentionally) dimmed of wit masses, to effectively push back before irreparable damage is accomplished. Please take the time (less than 20 minutes) to listen to Christina relate her research and personal experiences … It will be time very well spent! Find out more about Christina and her informative book by clicking on the provided links below. We at The Liberty Beacon Project commend the authors for their outstanding efforts. We highly recommend this publication for any who wish to educate themselves on the topic of vaccination and its parasitic relationship with big pharmaceutical companies, big government, corrupt and complicit health officials. This publication will assist you in truly comprehending the suffering this mechanism has rained down on trusting and unsuspecting parents, and too often, their innocent children. NOTE: The above is an excerpt from this book and can be found on pages 228 and 229 in the Endorsement section.